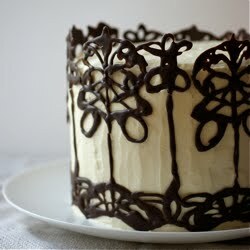 My post today is over on The Pastry Affair, a gorgeous baking blog written by Kristin Rosenau. Kristin started out as an astroparticle physicist. Then, in 2010, Kristin left physics to work as a baker (she's pretty good at it... Hello, Nutella Espresso Rolls.). She worked as a full-time baker for two years, tutoring on the side, then changed course once more, to go back to graduate school to become a physics teacher. As you can imagine, I've followed her journey with great interest as the parallels between our lives played out across the ocean. While Kristin goes through a few more life changes, she asked me to write a guest post. I made this soft, sweet braided bread with blueberry compote and cream cheese filling and got a bit carried away with braiding metaphors. You can find the post, recipe and photos of the finished braid here. Ca a l'air trop bon. Trop trop bon. Au fait, merci encore pour les recettes des meringues. Est tenté hier la recette des meringues francaises. J'ai fait un "tabac" (ai eu un grand succés). Ai mis quelques photos sur mon blog et me suis permise de citer votre blog. Hi Lucy. I'm so pleased you liked the post and have popped over here. With the braiding I did R over, then L over, then L over to go under R over, then R over to go under L over if that makes sense? You can also just alternate L-R, I was overthinking it that day! Hope that helps. Je suis heureux que vous avez aimé la recette, Marina. That bread looks quite something. Don't know about you, but I'm contemplating emigrating to the US exclusively for its cheap and plentiful blueberries. This looks wonderful....and how handy :-), we have lots of blueberries. Heh, I don't know that I'd go quite that far but I do love blueberries! Glad you like the bread. That's good timing. I'm glad you like it. New to your lovely space! I tried this yesterday with peaches and the bread came out looking beautiful and tasted great! Thanks much for sharing the recipe! how delicious, and you make it look so easy. i have to head over to see the final result! berries and cream cheese and pastry - what more could we want? This is *absolutely* gorgeous! Thank you for sharing! I've also beein following your blog & am always inspired - by both of you!! I haven't, no - unless I didn't realise it was his technique! I'll have to look into it. Thanks for the tip! I'm glad you like it! I hope the finished bread lived up to your expectations. Aw, I'm so pleased you find our blogs inspiring - thanks for saying so. DR odudu the great spell caster bring back my lover in a period of 48hours all thanks goes to dr odudu for making my life happy again i thought of committing suicide but when i contact dr odudu all my tears was clean am saying all this beacause life is too beautiful, with me now all days am aways happy with my lover,you that is there and you are saying you have lost all you have am hear to tell you now you have not lost any yet dr odudu is the answer to all problem contact him now at oduduspell@gmail.com or call +2348051913075 odudu is the answer,via oduduspell@gmail.com. and you want to be rich, powerful and be famous in life. dreams. You can achieve your dreams by beeing a member of the illuminati.